Guess who’s making headlines and turning heads. 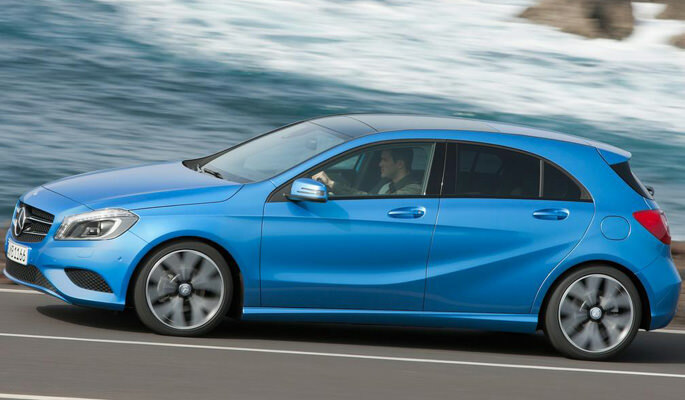 The new Mercedes A180 features a 1.6L turbocharged four cylinder engine that cranks out a respectable 122 hp. Moreover, the overall performance is improved since the vehicle weighs less than its predecessor. Weighing at 1.2 tons, the new A-class can go from 0 to 62 mph in 9 seconds which isn’t exhilarating, but you have to take the vehicle’s size and design into consideration. With a top speed of roughly 110 mph, this vehicle’s capable of zooming down the highway without a problem. Sleeker features of the front end exterior include a stylish headlight and grille design. Although it’s not a standard feature, the array of “diamonds” that shape the grill is quite striking. No matter which angle of the vehicle you face, its strong lines and large Mercedes LED taillights label sporty all around. The most impressive features, found inside the car, include the new dashboard layout, sporty front seats, and various silver accents. What really caught our attention though, was the A/C vents based on jet-propeller designs. Unfortunately, the size of the cabin makes it hard for anyone over 6 feet tall to ride comfortably. Additionally, the dashboard may seem a bit high so you’ll find yourself adjusting the seats before you find that “sweet spot.” Nevertheless, the Mercedes A180 is certain to capture the hearts of car enthusiasts around the world. Carbon fiber is a lightweight material that’s more impact resistant than steel. ScopioneUSA offers a wide array of carbon fibre car accessories and auto parts for your vehicle. These include aftermarket carbon fiber spoilers, grills, and bumpers as well as parts for the hood, lip and trunk. We also offer custom modifications for many different makes and models. If you’re looking for quality carbon fiber aftermarket parts, check out ScopioneUSA!